Quick Take: I love the toasty grain, the sweet resin pine and dry, bitter finish that Shape offers, but find the very mild but present skunky cannabis aspect a turn off. Regardless, PA/NJ drinkers have every right to be excited for what Neshimany Creek brewed, which has the toasted grain and orange juice qualities of higher profile New England style IPAs that are woefully underrepresented in the Keystone State. While this beer wasn’t a punch in the face awakening, it did take a swing at me and make me take notice of Neshaminy Creek as a brewer. A solid DIPA and one I think most bitter-is-better IPA drinkers will dig. Brew Facts: The head brewer of Neshaminy Creek, Jeremy Myers, was voted the Brewer of the Year 2014 by Philly Beer Scene Magazine. They also took a gold at the 2013 GABF in the Vienna Lager category with their Churchville Lager. Not bad for a brewery that opened in 2012. Appearance: I pop the top and get my eyes all over this beer for the first time. It pours a blend of gold, straw and copper colors with that standard white bubble ring that clings to the glass edges. Other than the minimal head, it’s pretty much what you’d expect of a DIPA. Of course, meeting expectations makes it no less delectable. For me, I find the looks of a good IPA can go one of two ways. Either it’s a cloudy, silt-filled stream that light can’t penetrate, ala Tired Hands, or like what we have here with an attractive clarity that borders on crystalline. A fine, if not standard, looking DIPA. Aroma: A few inhales and I’m hit with toasty grain, my nose gets some sesame for some reason, orange, pine, and juicy grapefruit. A bit of the pine touches on astringent cleaner levels, but balances out with time and hardly worth mentioning (yet I did). It’s a combination I’ve found enjoyable in a number of New England IPAs and shares similar qualities to Stone’s Enjoy By for a point of reference. Taste/Mouth Feel: A sip and I’m initially surprised at the thin, soft mouth feel and small-bubbled carbonation. Not a deal breaker, but unexpected. While it may drink like a soft pale, the flavors are far from it. A lemony citrus bite, peach and resin folded into a bready, slightly sweet body with a ripping bitterness that suggests the malt body and fruity hop profile of a pleasing, yet typical American IPA. But then comes the skunk. Specifically, dank, skunky hops that lightly linger over the entire experience with a hint of cannabis. A very distinct, although subtle, flavor that defines Shape of Hops for me. Final Thoughts: Let me state this at the start: I love the toasty grain, the sweet resin pine and dry, bitter finish that Shape offers. With that said, I have to admit that my tastes have yet to catch up to the skunky cannabis trend that appears to be gaining traction in the IPA world. Look no further than the popularity of Bissel Brother’s The Substance for evidence of this; a beer that tastes like fermented bong water combined with the resin scrapped from Doug Benson’s lungs. Maybe I’ll come to appreciate this quality as it is further refined, but right now, it’s not something I seek out. This extends to a certain…let’s say enjoyment of Shape of Hops that is rooted more in admiration than what my tongue is relaying to my brain. Even though the cannabis aspect of Shape of Hops is quite mild, I find myself fixated on it like a buzzing fly that just won’t go away. 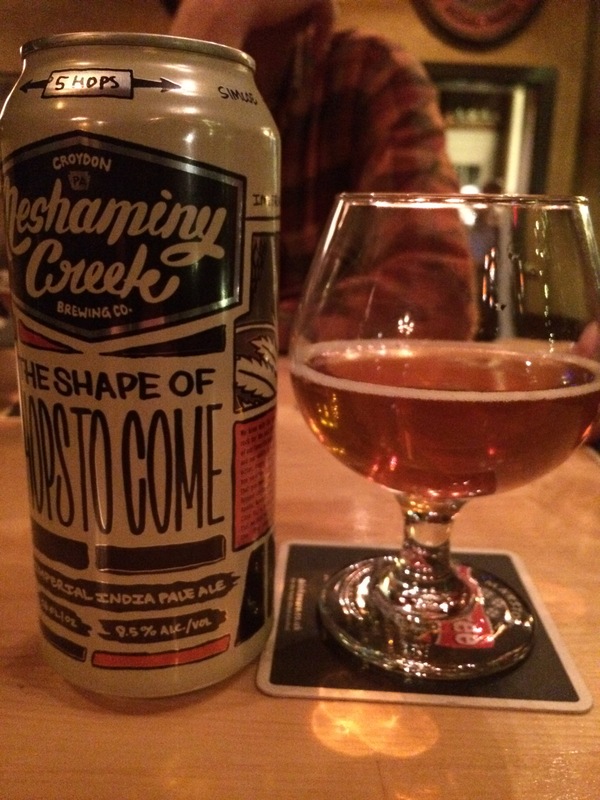 Regardless, PA/NJ drinkers have every right to be excited for what Neshaminy Creek brewed, which has the toasted grain and orange juice qualities of higher profile New England style IPAs that are woefully underrepresented in the Keystone State. I don’t think it’s quite to the level of breweries like Alchemist, Bissell Brothers, Foundation, Maine Brewing, etc, but “not quite” is still pretty damn good. While this beer wasn’t a punch in the face awakening, it did take a swing at me and make me take notice of Neshaminy Creek as a brewer. While I’ve experienced a few of their beers in the past, this will push me further down their beer soaked rabbit hole (quite an image) to see what else they’ve come up with. As it stands, Shape of Hops is a solid DIPA and one I think most bitter-is-better IPA drinkers will dig. Recommendation: Worth seeking out for the discerning PA/NJ IPA beer nerd. Previous Post Dry vs. Wet-Hopped – What’s the Difference?